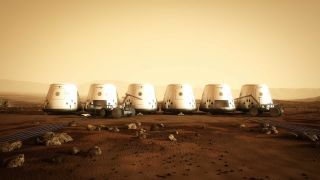 Mars One hopes the 2025 landing establishes a permanent and growing Red Planet colony, with more settlers arriving every two years thereafter. The organization plans to pay its bills primarily by staging a global media event around the settlement effort, from astronaut selection to the colonists' time on Mars. "It is a great privilege for DSP to be chosen to exclusively follow the incredible journeys of those who will make humankind's first footprint on Mars," Iain Riddick, DSP's head of special projects and digital media, said in a statement. "This has to be the world's toughest job interview for what is without question a world-first opportunity, and the human stories that emerge will captivate and inspire generations across the globe." There will be some spaceflight action before the first launch of humans toward Mars. Mars One plans to mount several unmanned missions in the next 10 years to demonstrate required technologies and prepare the ground for the arrival of people. A robotic lander and orbiter are scheduled to lift off in 2018, for example, followed by a scouting rover in 2020 and six cargo missions in 2022. More than 200,000 people applied to become Mars One astronauts. That pool has been slashed to 705 candidates, who are now being evaluated by a panel of experts during a series of interviews. The applicants signed on to live out the rest of their lives on Mars; at the moment, there are no plans to bring any of the Red Planet pioneers back to Earth. DSP has produced many documentaries and TV programs over the years, including "Earth from Space" for NOVA and Discovery Canada and "Neil Armstrong: First Man on the Moon"for BBC Two.